Hey all — many years ago I bought this yellow Colnago when it was built up as a single speed to try that out. I ended up not liking the SS, but kept the frame as it looked cool without being some mint condition thing I’d be scared to tinker with. Ultimately, I haven’t gotten around to doing anything with it, and I may sell it, may build it up, may donate it — depending on what I have. I’m pretty sure it’s around 60/61mm size. Any information you can give me based on these photos? Year/range? Value? Desirability or lack of? 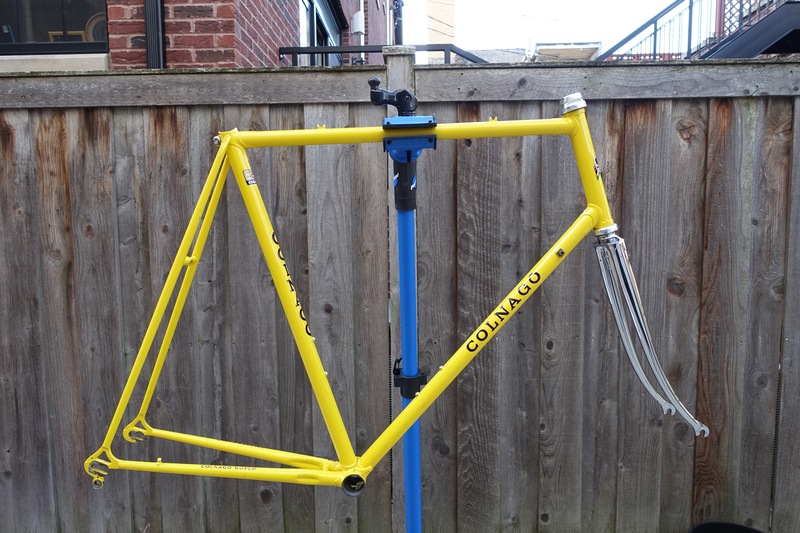 Your frame is probably a genuine Colnago. It is NOT a Master. It says "Colnago Super" on the chainstays which is likely accurate. Probably repainted at some time, then later scratched and touched up. My guess is it dates back to the mid 70's or perhaps very early 80's. It looks taller than a 60 cm. Maybe 61 or 62 cm? You are measuring from the middle of the bottom bracket to the top of the top tube (or seat post mast), along the seat tube, right? As far as value, you're probably looking around $400 to $500 for the bare frame, headset, and seat binder bolt. That frame looks to be in good shape. I agree that it looks bigger than 60 cm. I think you should be able to get 500 easy for that. Campy headset is worth $50 or $60. Thanks for the information. Much appreciated. I reposted this in a hurry as I misspelled 'Colnago' the first time, and meant to write Super instead of Master. I'll get a good measure of the frame, and thank you for the proper measure technique. Cheers!